There is a free version that lets you ‘try before you buy’, but this is limited to a single trip and 25 items. To access more functionality, including support for Dropbox, TripIt, templates and multiple users, you’ll need to fork out $1.99 via an in-app purchase. There’s also a dedicated version for iPad. When you first launch the app, you can start a new trip, use a trip template or import existing trips from TripIt. In this instance, I’ve chosen to add a new trip. You can add any number of items to your trip, from clothing and medicine, to documents and gadgets. Whilst the app comes with categories pre-instaled, you can add to, and edit, these categories to make it more relevant to you. 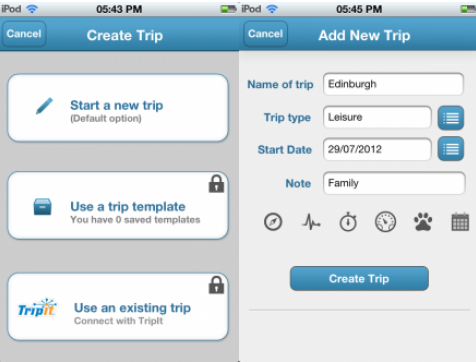 TripList could be used for any kind of trip really – leisure, business, camping, cruises, road trips…you name it. A key feature of the paid version of the app is that it supports multiple users, so if you’re traveling with friends or family, you can all contribute to the same lists. Each user is assigned their own picture or avatar. The recently-launched version 2 of the app is in many ways a complete overhaul, with the multiple users feature, templates and TripIt/Dropbox integration rolled out. In addition to a new UI. TripList is a nice app, but my one gripe with it is that you have to keep clicking ‘save’ or ‘select’ when setting up lists, whereas tapping or swiping feels like a more natural way to use this app. For example, when I was scrolling through items, I found myself tapping on them, only to then have to guide my finger towards the ‘select’ button. Maybe I’ve just become too accustomed to navigating a screen’s real estate in this manner, though, and it’s far from a deal-breaker.